HOUSTON (Nov. 24) – Funny, isn’t it, how life sometimes can turn on a dime. 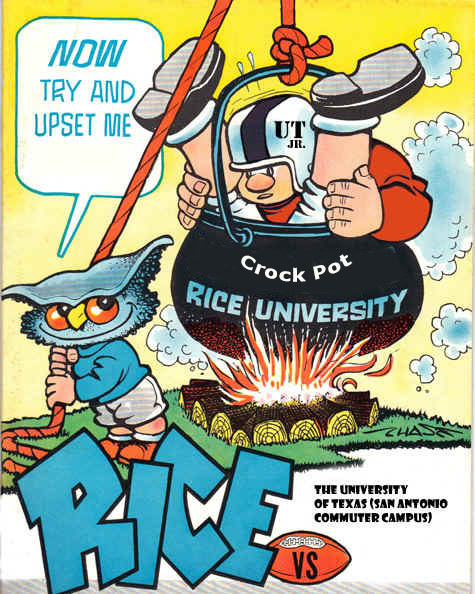 The Rice Owls were only hours away from their winter of discontent, assuming, after today, they’d have lost 12 straight games, 21 consecutive league contests, and, well, you know the rest. 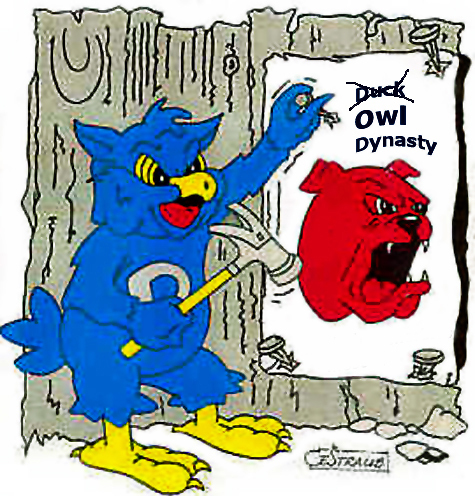 A season-ending loss to Old Dominion and the resultant extension of that loss skein would have heightened doubts about the overall course of the football program, dampened recruiting efforts, and further elevated the sense of ennui already prevalent among even the most die-hard of Owl fans. But here we are, a few ticks of the clock later, and lordy, the damned sun has suddenly come up. 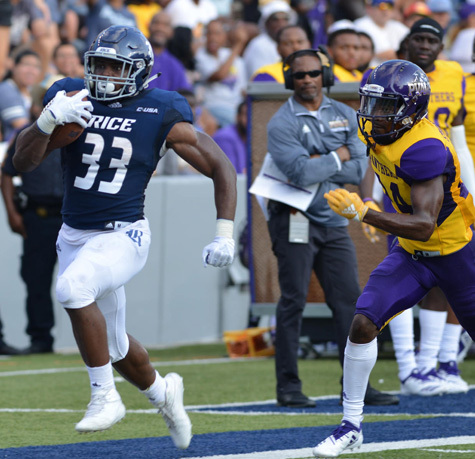 Realistically, Rice’s 27-13 win over ODU doesn’t erase any of the strategic inconsistencies and the talent gap demonstrated in this season's disappointing campaign. It doesn’t lessen the amount of toil the Owl coaching staff and squad will need to put in during the next few months, the holes that need to be plugged, the roles that need to be filled. But talk about an attitude-adjuster! Those of you out there with your hands raised; you wish to object, no? 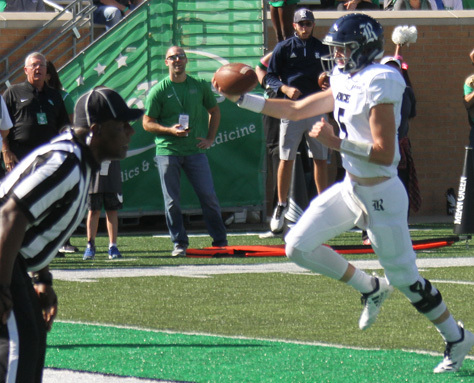 Granted, this single win over an eight-loss team is hardly conclusive to the proposition that Rice coaching’s “pound the rock, run the clock” philosophy is one that will take the Institute Boys to the next level. BATON ROUGE (Nov. 18) – OK. So we’re not nearly as good as LSU. That much is clear. We knew that going in. In fact, so are about 120 other Division One football programs out there. Then what are the takeaways from this little experience in the land of gumbo-and-boudin? 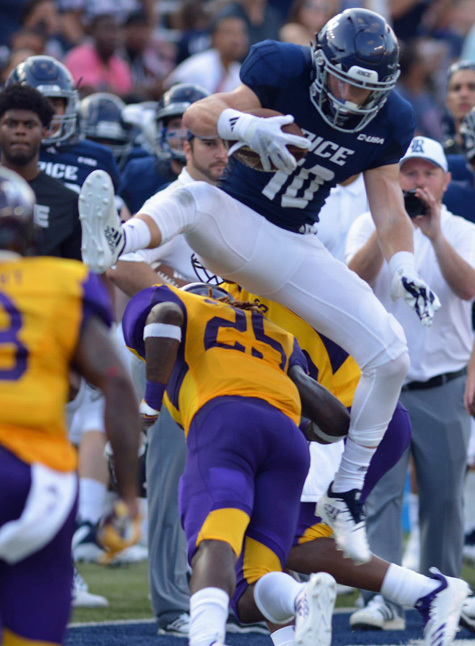 Rice head coach Mike Bloomgren was hardly sanguine, in fact could almost be described as upbeat, in his post-game comments after his Owls bowed to the Bayou Bengals by a 42-10 count at Tiger Stadium here Saturday night..
Orgeron: "Run the ball. Play-action pass. 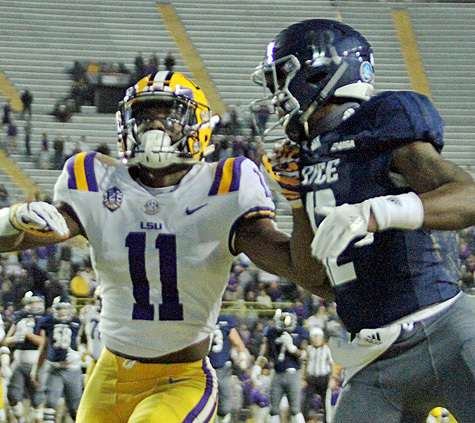 Deep passes"
HOUSTON (Nov. 15) – What does a one-and-ten team do when it’s faced with traveling into a hostile territory, a packed house, facing the number seven team in the nation, with not just a hell of a lot good having gone down for them thus far in the season? Well, just maybe that one-and-ten team goes into the contest with heads held high, relaxed but keyed up and ready, and takes to the gridiron and has itself some fun. This is a game for the young, after all. 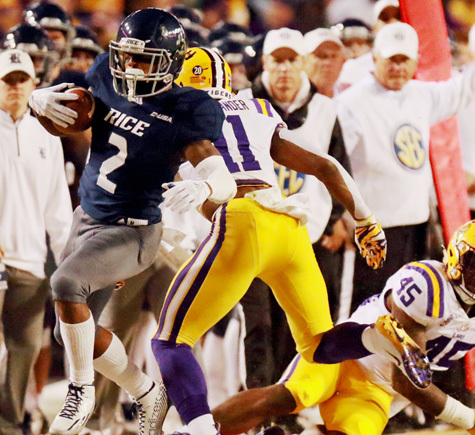 The Rice Owls – yep, they’re that one-and-ten team -- face the seventh-ranked LSU Tigers, amid the unfriendly confines of Tiger Stadium, Baton Rouge, locally known as Death Valley, with a 6:30 PM kickoff on Saturday night (ESPN-U). RUSTON, La. 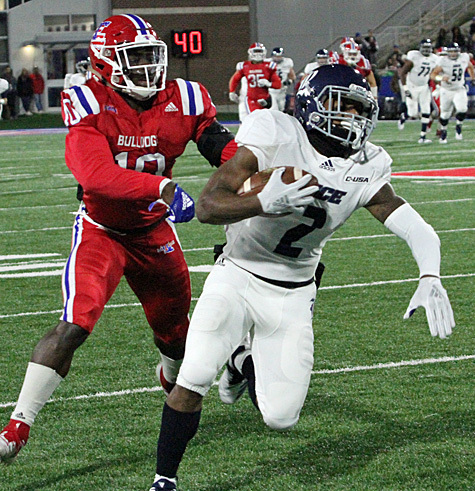 (Nov. 11) -- The Rice Owls showed brief flashes of what yet might come to pass in the not-too-distant future, in a 28-13 loss to Louisiana Tech here on a cold, dank November Saturday night. 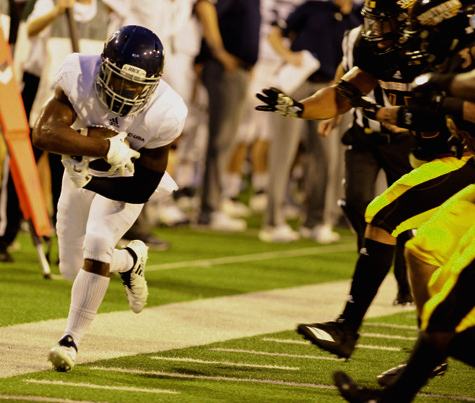 Despite the loss, there were bright spots for the Owls on both sides of the ball, as they were in the thick of the fight through midway in the fourth quarter, when a promising drive stalled and the Institute had to settle for three, bringing the score to 21-13. It looked as if the Boys of South Main might cut the Tech lead to four at that point, but instead, the Bulldogs quickly put some distance between the two teams when, keyed by a 44-yard pass play on a post route, quarterback J’Mar Smith to his frosh reeiver Wayne Toussaint, they managed to tack on another TD to put the game out of reach. “I think LA Tech is a talented, well-coached team,” a resolute Rice head coach Mike Bloomgren said postgame. “For us to take them into deep water and bring it to within one score in the fourth quarter was huge." 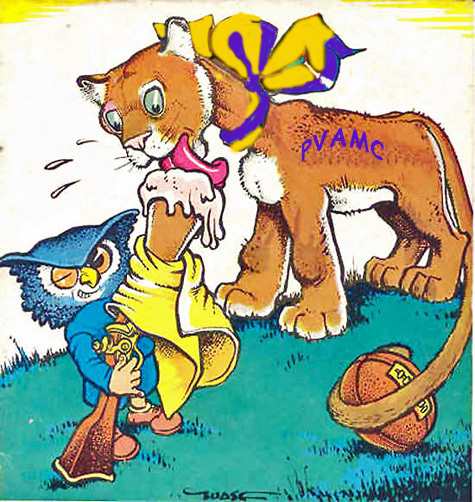 LSU's 77-0 runup against Owls left fans screaming, "more, more, more"
Did you forget that Mike the Tiger is Keto? How many more QBs can Owls play? 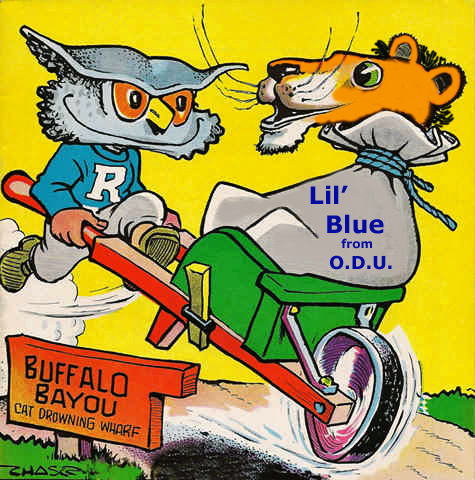 HOUSTON (Nov. 8) – As perhaps a bit of a prelude to the Rice Owls’ Nov. 17 Date in Death Valley with LSU, the South Main Boys travel upstate to the metropolis of Ruston, Louisiana, to take on the Lousiana Tech Bulldogs Saturday, kickoff 6:00 pm. The ‘Dogs are only 26.5 point favorites in this one, which makes one wonder how wide the line will be for next week’s game. Anyway, in this contest, there are at least a few circumstances breaking in the Flock’s favor. Not a lot, but a few. 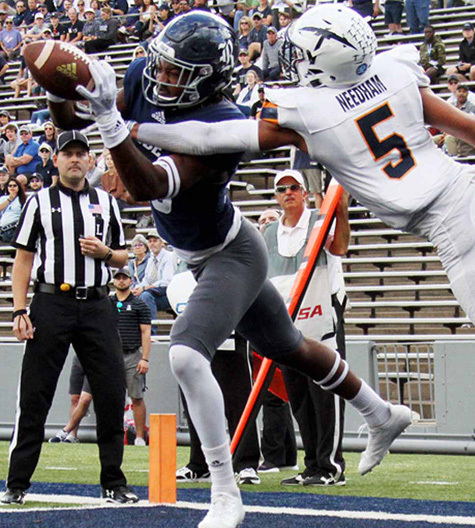 HOUSTON (Nov. 4) – On the first play from scrimmage in Saturday’s game between the Rice Owls and a formerly-winless UTEP team, Miner quarterback Kai Locksley lofted a perfect spiral to his receiver Warren Redix as he streaked down the sideline in front of the Rice bench. 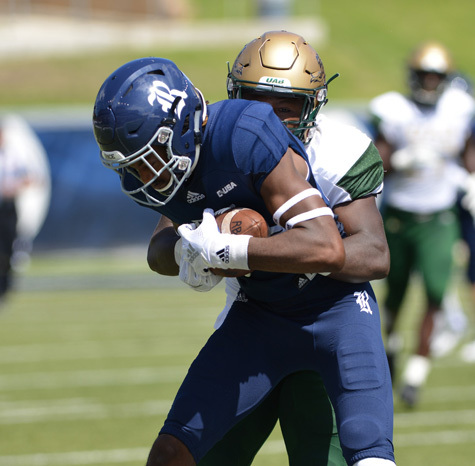 The little-used receiver caught the ball in full stride and thus wrought a 42-yard gain, putting the Miners in business at the Rice 33 yard line. It was a blow from which the homestanding contingent never recovered, surrendering a lead that stretched as wide as 34-3 late in the third quarter, so that a furious 23-point second-half comeback surge was doomed to fall short. What's caused LA Tech's offense to regress? 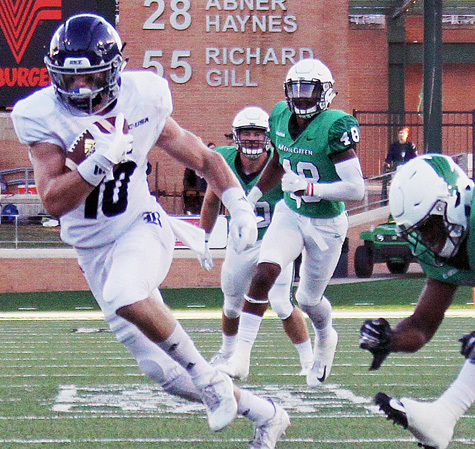 DENTON (Oct. 27) – The Rice Owls played a more experienced, veteran North Texas team right off their feet for exactly 44 minutes and 56 seconds of this football game here Saturday. But a combination of youth, deficit in athleticism, and -- let’s be blunt about it -- a series of highly questionable judgment calls against an aroused group of young men from South Main, combined to produce a misleading 41-17 final score in a contest which was tied as of five seconds to go in the third quarter. This one stands to be the most frustrating loss in a most frustrating season for the Owls, for the game produced yet another Player at the quarterback spot, along with a number of other Players who got their first chances, really, to be one. 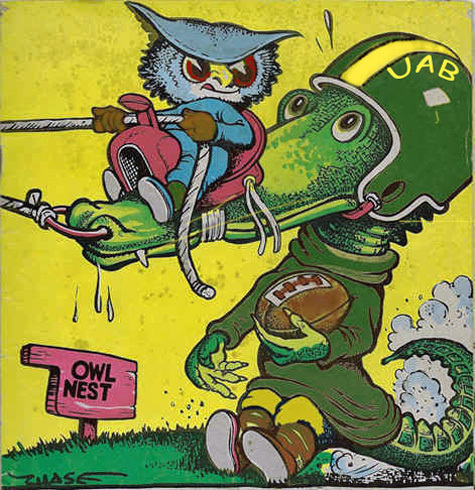 And if the defense had not been kept on the field repeatedly by fourth-down-negating personal foul calls of various varieties, we’re not saying the Owls would have won. But they might have. And they would have been in a much better position to carry the fight to the bitter end. 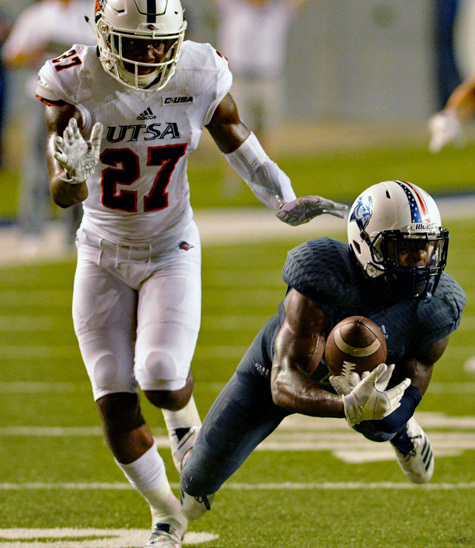 Will UTEP football join dubious club of futility? Can UTEP break the losing streak? HOUSTON (Oct. 23) – At the end of the middle third of the last century, a time known only to a scant few of the viewers of this page, yours truly went out for Rice freshman basketball, failing to make the team, but nailing down the manager’s spot as a guy who could step in and scrimmage in a five-on-five if any of the squad went down. The coach was an odd, Cepacol-chewing ex-marine by the name of Bo Brickels. Bo had a strict nomenclatura for his athletes, and he labeled, treated, and addressed each of them accordingly. 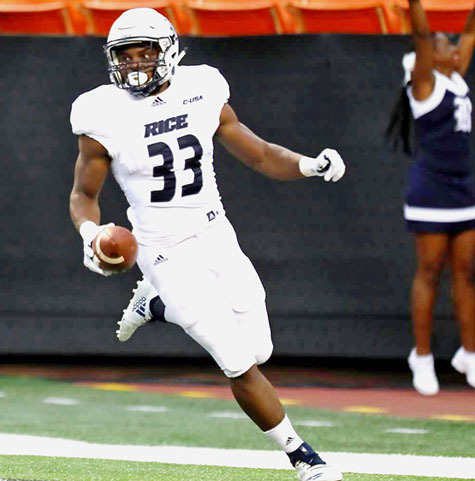 MIAMI (Oct. 21) – In the waning moments of the third quarter, with his Owls down but still battling with a division-leading FIU team, Rice QB Evan Marshman found a gap, headed for the pylon and scored from 22 yards out to cut the lead to 26-17 and arouse hopes for an upset victory. But when the freshman signal caller arose from the din and ran off the field to greet his celebrating teammates, his left hand was left dangling from his side. An injury it was, the verdict unknown, but speculation centered around the little finger of his (non-throwing) hand. In the event, he didn’t take the field for the remainder of the game, and the Institute Boys were left to press on without him, having found a definite spark of ignition in his field generalship the first three quarters of the contest. 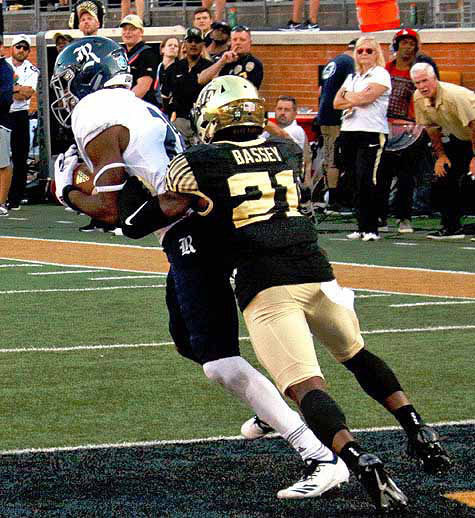 Coach Bloom: "It's on me...."
WINSTON-SALEM, NC (Sept. 28) – In a half-way rational world, two institutions such as Rice and Wake Forest would be expected to line up on even terms on the athletic field, and go toe-to-toe in their game coming up here Saturday (2:30 CDT). S imilar academic philosophies, commonly small enrollments, generally equivalent aspirations, if not out out-and-out scholastic peerage, at least in the same echelon – one could hardly expect any more evenly-situated athletic opponents. 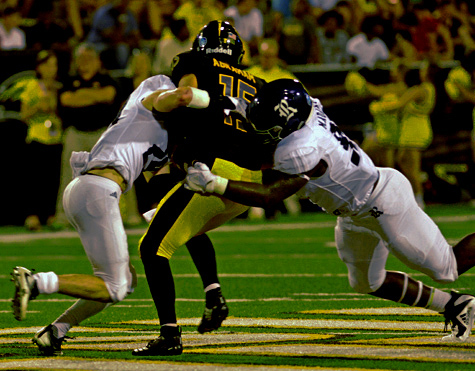 HATTIESBURG (Sept. 23) – Well, it wasn’t the end of the world, but it certainly was more than a minor chug hole on the Rice Owls’ road back to respectability. 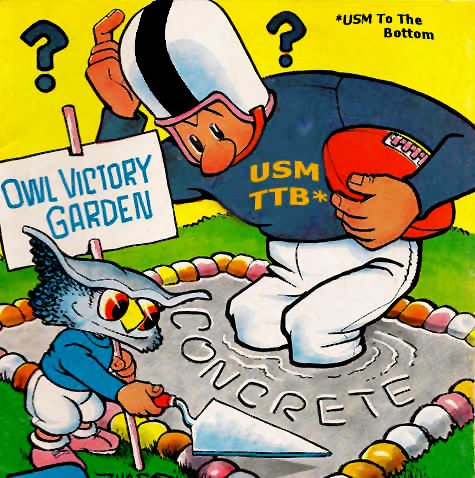 The Southern Miss Golden Eagles manhandled the visitors from on South Main with a disturbing air of routine here Saturday, coming out on top by a 40-22 score in a game the Owls were never really in, beyond the first half. 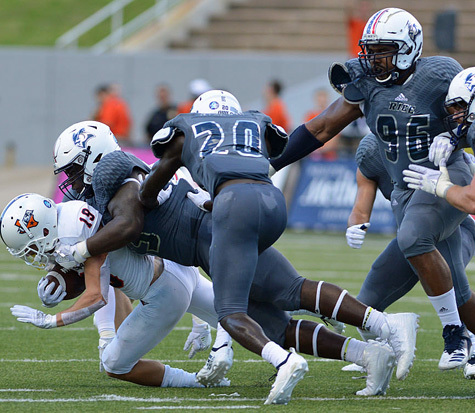 For a just glimmer, though, midway in the second quarter, it looked as if the Owls, despite a sluggish start, might be ready to take over the game. 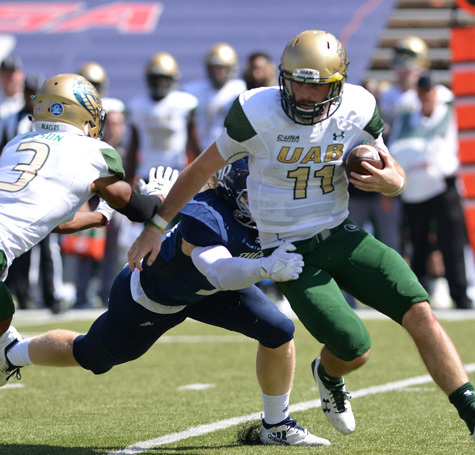 HOUSTON (Sept. 18) – Hope arises, if not thrives, three games into the Mike Bloomgren era on South Main. 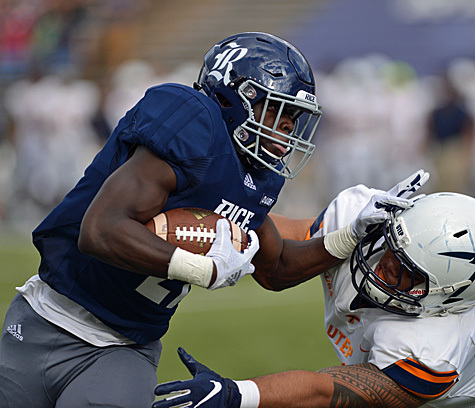 The Rice Owls, losers of two out of their first three contests on the season, nonetheless have shown precision, cohesiveness and a general sense of, call it teamliness, that – can we say it? Has been missing except in the most fleeting of moments over the past decade. The results of those first three outings say: We ain’t dead yet. Far from it. HOUSTON (Sept. 6) – Wheels are down for the Rice football team in Honolulu today, and the first item on the agenda for Owl head man Mike Bloomgren is to take his charges on a respectful tour of Pearl Harbor, which we’ve all grown up learning was the site of the most dastardly sneak attack on the sovereignty of the United States in its now 250-odd-year history. Come Friday morning, the South Main boys will get to take the launch out and stand and watch the oil slowly ooze from the sunken hull of the U.S.S. Arizona, and be moved. Next on the menu for the Owls, however, will be strictly business. 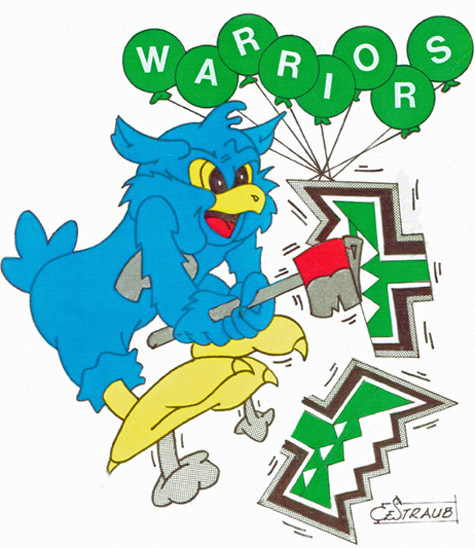 And in that respect, they well might take a cue from their brief digression into history, and come up with a sneak attack of their own that will surprise and shock the presently high-strutting Hawaii (formerly Rainbow-) Warriors. 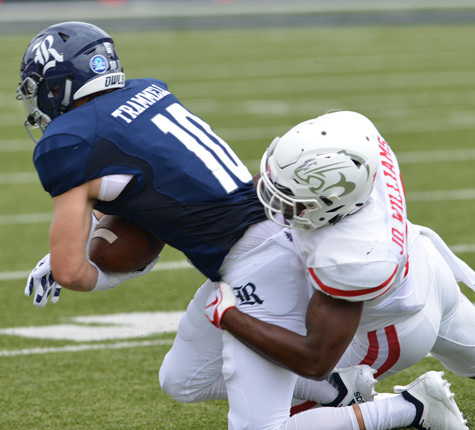 HOUSTON (Sept. 2) – When the Rice Owls surged to a 27-17 lead midway in the third quarter of their game with the University of Houston Saturday, one already could have declared the day a successful one for the Boys of the Institute. 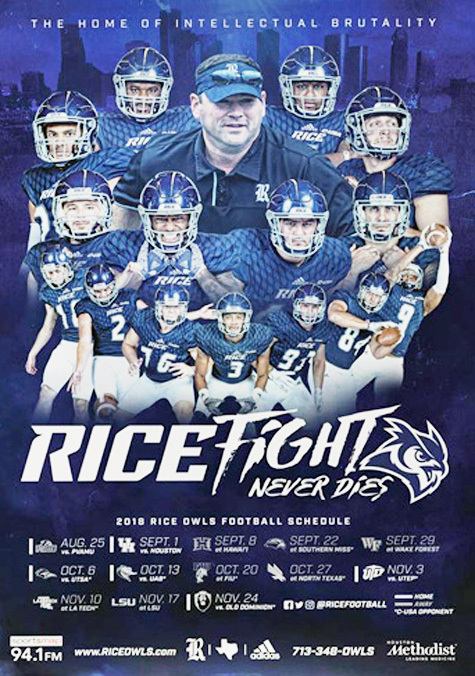 A near-30-point underdog, given zero chance to be competitive against its high-octane cross-town rival, Rice had worked the playbook of the new head Owl Mike Bloomgren strictly by-the-book, if not to perfection, establishing a credible passing attack to augment its already- established running game, forcing three-and-outs on defense and refusing to allow their opponent to turn field position advantages into touchdowns. In truth, the score quite easily could have been more one-sided in favor of Rice at that point in the game. At the very least, nothing about that ten-point Rice bulge could have been considered flukish. 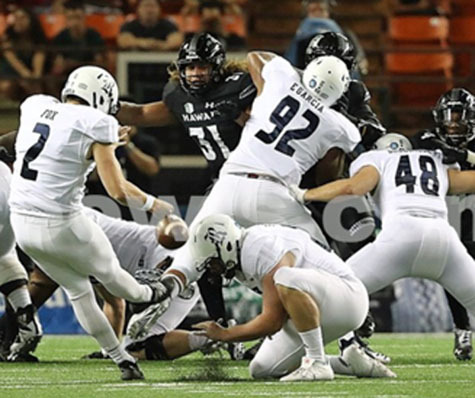 What will Rice offense look like against Hawaii? 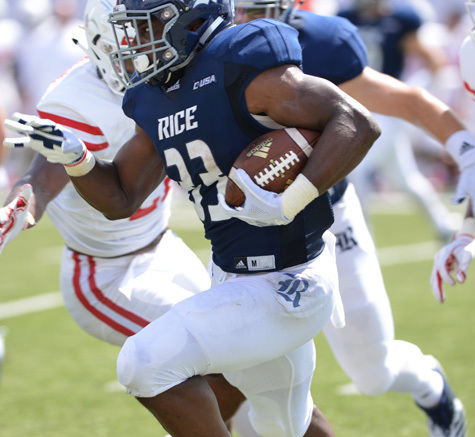 HOUSTON (Aug. 30) – The new-look Rice Owls face one of their most daunting tests of the season as they take on the cross-town rival University of Houston Cougars at Rice Stadium in an 11:00 a.m. kickoff Saturday. 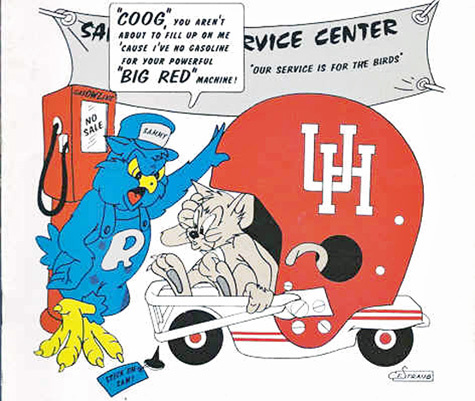 There’s hardly a soul on either the Owl side or the Coog side of South Main Street who gives the Owls much of a chance to compete against the Coogs, with their high-octane, up-tempo offense and their defense led by the most decorated and celebrated defender in the land in defensive tackle Ed Oliver. 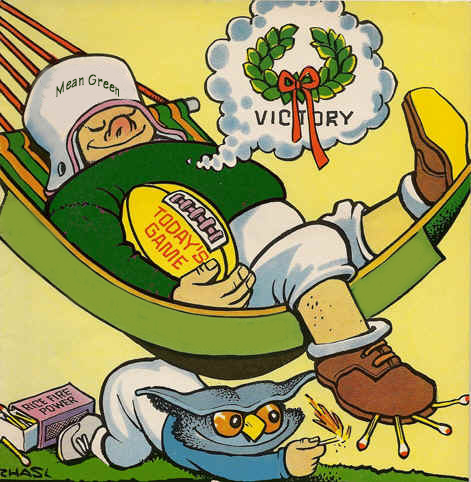 To hear it told, the Owls ought just as well to roll over and play dead, like so many pill bugs, against the vaunted defensive thrust of Oliver, who already has one Outland Trophy under his belt and is bucking for a second one, not to mention the number one spot in this year’s upcoming NFL draft. 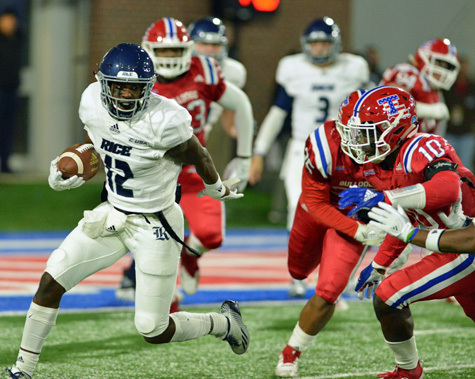 HOUSTON (Aug. 26) – What’s perhaps more remarkable about Rice’s last-gasp, comeback win over Prairie View Saturday was not the means of achieving victory but rather the very fact that the Owls were able to avoid defeat. Down 28-19 with under 12 left in the game despite scoring on their first four possessions in the first half, the Owls just burred their necks, bit their lips, and put an exhibition of determination that Rice fans have not seen very much of in the past decade, using big plays on defense to wrest control of the game and score on a touchdown, a safety, and a last-second, 23-yard Jack Fox field goal to provide the final 31-28 measure of triumph.. The game began with a display of offensive power by the Owls which gave heart to the most pessimistic of their supporters. But that shortly was followed by a second- and third-quarter defensive swoon that reminded local die-hards of the same old same-old deficiencies that have befuddled Institute defenders for what seems like decades. In the end, the team’s true grit won out out – and that’s a pretty decent stepping-stone from which to start the Owls' latest attempt at resurgence. Is Major Applewhite on the hot seat? 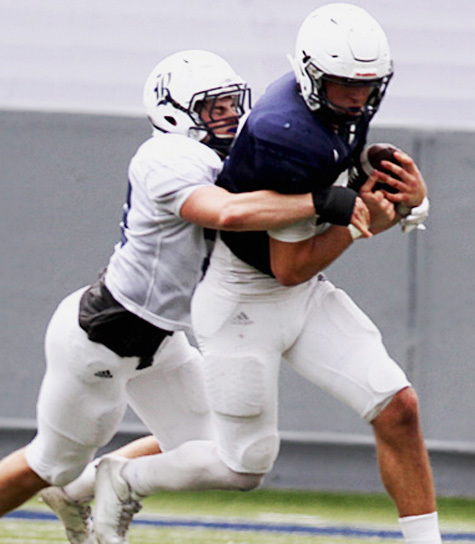 HOUSTON (Aug. 22) – The Mike Bloomgren era begins amid enthusiasm among diverse quarters as the Rice Owls open their 2018 season’s dance card with the Prairie View A&M Panthers, a 6:00 p.m. kickoff at Rice Stadium Saturday. But along with the almost universal exclamations of good feelings out South Main way comes an underlying wave of anxiety, albeit a bit stifled, among the nearest and dearest of Owl fans, who are as if whistling in the dark as kickoff looms. 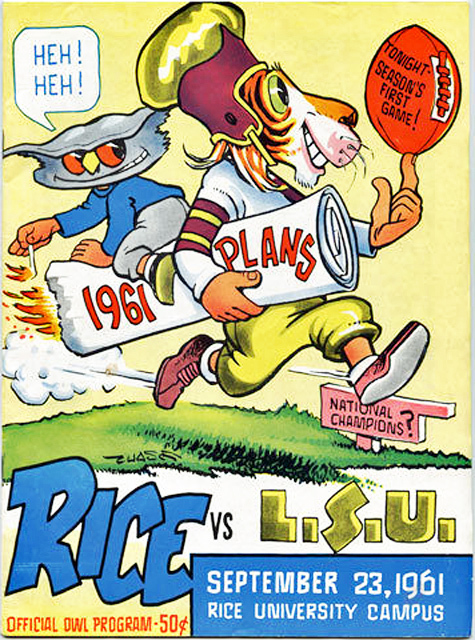 Those loyalists can’t help but remember the inaugural effort of the previous administration, when, 11 long, painful years ago, a newly-implemented Rice coaching staff laid a huge egg in a 16-14 loss to Nicholls State, a middling Division IAA (now, “FCS”) entrant. Prairie View is likewise a second-rung program, but it’s a crew that’s recently demonstrated that it can put points on the board, whether in victory or defeat. 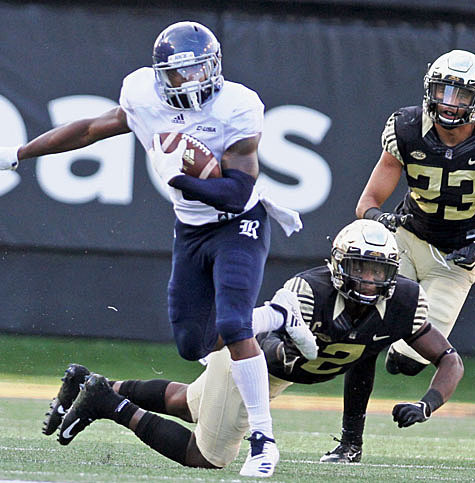 Can Panthers challenge Owls on Rice's home turf? 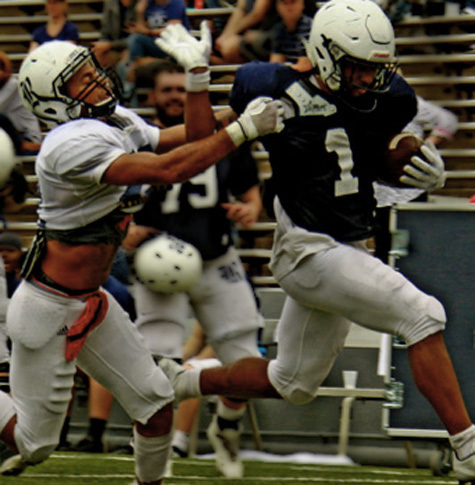 HOUSTON (Aug. 11) -- Pads were a 'poppin' on the floor of Rice Stadium Saturday evening as full scrimmage number two unfolded before a small but enthusiastic Owlfest crowd. Lightning in the area put off the on-field action for over an hour, and the delay and the wet-ish weather held down attendance, but Rice head coach Mike Bloomgren said his staff had achieved the necessary level of progress by way of the evening's scrimmage reps.
"We're less fluid than we were," the Rice Head Man said aftewards. "Right now we've got a couple of battles stilll going on, and I think the films will be huge in determining things." He added that Sunday's team meetings will convey to the players where they stand on the depth chart and what they need to do the move up. 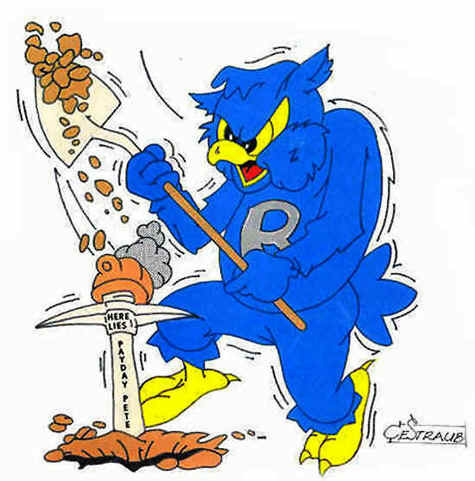 With the Owls' home opener against Prairie View looming a week from this coming Saturday, it's time to sharpen the hoe. 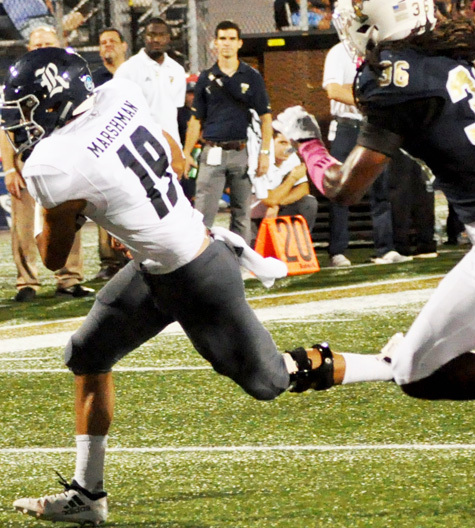 On the 18th, the Rice staff will hold a mock game -- but check in with the football staff before showing up. HOUSTON (Aug. 5) – The first thing to be noticed upon entering Patterson Center at lunchtime Saturday was the Bill of Fare. No empty calories here. Like the rest of what’s going on within, it’s all business. Lean meats. Grilled vegetables. Lots of fresh fruit. Refined carbohyrates kept to an absolute minimum. Sauces, sparely used, pretty much sugar-and fat-free. The traditional post-prandial ice cream treats? Not to be seen. 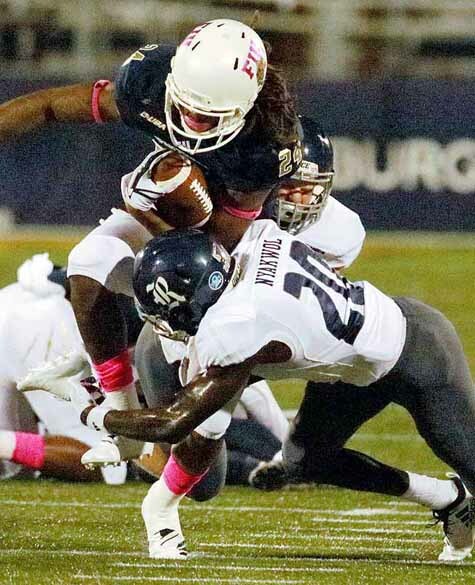 Call it the Stanfordization of Rice Football, or call it something else. 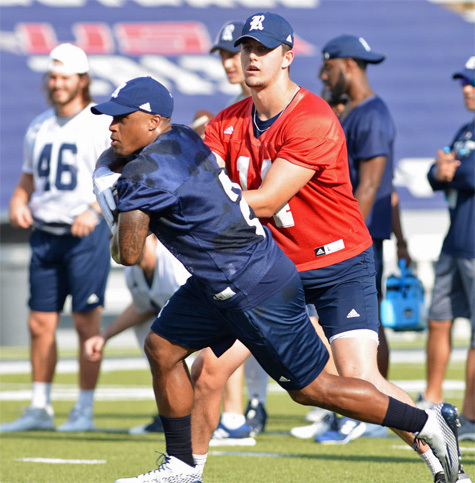 In any case it’s Something Different – which aptly labels so many other routines, requisites and activities going on within the hallowed halls of Historic Rice Stadium these Dog Days of August. Here, still a full week before the rest of the student body enter The Hedges to start the upcoming semester, new cookbooks, new recipes, new regimens are awash. For the time being, it, like the gorilla’s kitten, is “All Ball.” No classes, no orientation sessions, no distractions. 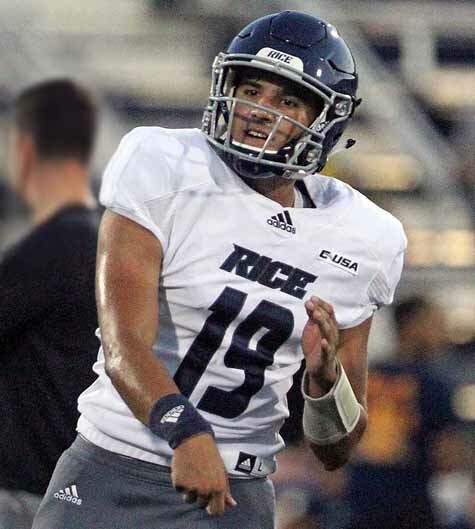 "I started off the team meeting this morning saying it was all ball, all day for the next week," new Rice Head Man Mike Bloomgren said this weekend. "They have nothing else on their plates and have all the time in the world to come over here and get with this awesome coaching staff. I want to make sure we are masters of our scheme." On tap Monday is the first scrimmage of the season, one calculated to separate sheep from goats, or, more specifically, the “go” team from the scout team. "Tomorrow we have a scrimmage and that's going to move the depth chart up and down," Coach Bloom added. "It's all on them to determine which way they want to go. That's the really cool thing about it being a meritocracy. By the way, don’t plan on dropping by HRS to watch a few scrimmage reps – they’re closed to the hoi polloi. 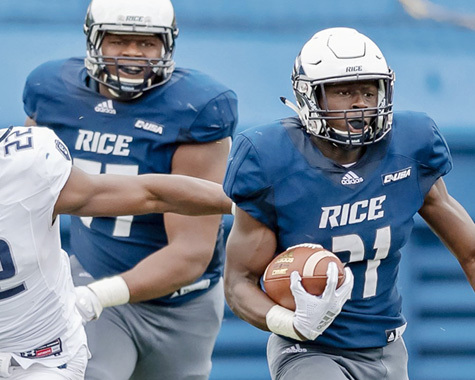 Rice coaches quite reasonably are keeping brand new schemes close to the vest in anticipation of the Sept. 25th “Week Zero” home opener with Prairie View. In other words: If you wanna know what we’re gonna do, go buy yourself a ticket. Can Rice become the Stanford of C-USA football? What are reasonable expectations for RIce? “Very tough feeling walking off our home field against a conference opponent ... that we should be on a level playing field with"
'It was disappointing for the whole team. THe defense as a unit played very well, but obviously that didn't get it done. This is a team game"
''As soon as that first touchdown, it was like,"We're here. "But football is four quarters.You have to respect all your opponents"
'From the first time I stood up here, I talked about the importance of hiring a great coaching staff. We've done that"
"'Supe in my mind is made for an offense like this, and the twins have been unbelievable, making play after play"
"In thinking of my fatique, I'm thinking of how much I've gotten done; I'm thinking of plays and reps"